We now have quite a bit of okra and eggplant coming on in the garden. Every few days my husband harvests enough for our family, plus some to share with friends. I only recently discovered how nicely the two pair together with some tomato and green onions. It is both delicious and colorful, with a lovely combination of textures and flavors that is very satisfying. It makes a great side, or a perfect summer lunch with some crusty bread. Place 1/3 cup olive oil and a little salt and pepper into a gallon ziplock bag. Salt the eggplant slices and place them in the bag. Shake bag to coat eggplant with oil. Add okra and shake again. 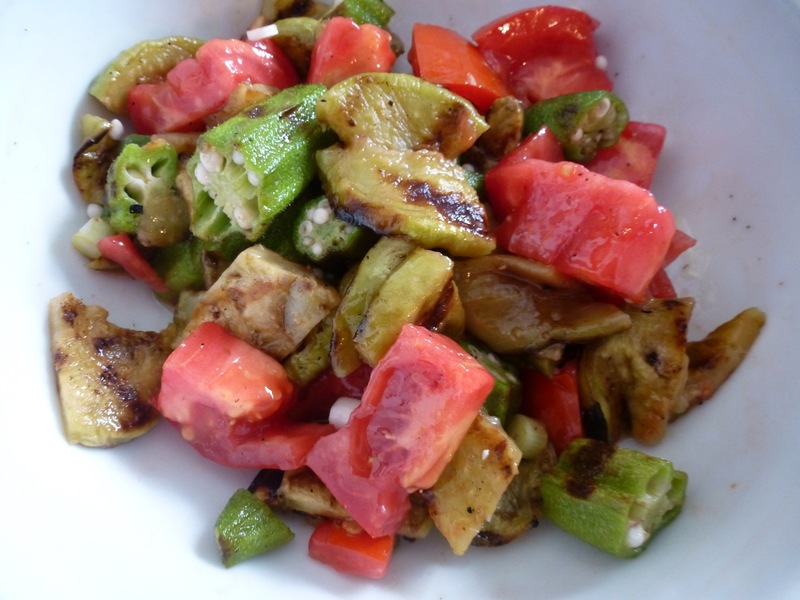 Place eggplant and okra on preheated medium-high grill. Grill eggplant for 8-10 minutes, turning once or twice until lightly browned and tender but not mushy. Grill okra, rotating until all sides are evenly browned. Remove vegetables from grill and let rest 5 minutes. Rough chop the eggplant and okra and place in a serving bowl. Add chopped tomato that has been seasoned with salt and pepper. Add green onion. Check for salt and pepper. Add 3 Tablespoons of olive oil, or more to taste, then toss. Serves 4 as a side dish. This entry was posted in Appetizers, Salads, Vegetables, Vegetarian. Bookmark the permalink.